35:1 The Lord spoke to Moses in the plains of Moab by the Jordan at Jericho, saying, 2 “Command the people of Israel to give to the Levites some of the inheritance of their possession as cities for them to dwell in. And you shall give to the Levites pasturelands around the cities. 3 The cities shall be theirs to dwell in, and their pasturelands shall be for their cattle and for their livestock and for all their beasts. 4 The pasturelands of the cities, which you shall give to the Levites, shall reach from the wall of the city outward a thousand cubits all around. 5 And you shall measure, outside the city, on the east side two thousand cubits, and on the south side two thousand cubits, and on the west side two thousand cubits, and on the north side two thousand cubits, the city being in the middle. This shall belong to them as pastureland for their cities. 1And the LORD spake unto Moses in the plains of Moab by Jordan near Jericho, saying,2Command the children of Israel, that they give unto the Levites of the inheritance of their possession cities to dwell in; and ye shall give also unto the Levites suburbs for the cities round about them.3And the cities shall they have to dwell in; and the suburbs of them shall be for their cattle, and for their goods, and for all their beasts.4And the suburbs of the cities, which ye shall give unto the Levites, shall reach from the wall of the city and outward a thousand cubits round about.5And ye shall measure from without the city on the east side two thousand cubits, and on the south side two thousand cubits, and on the west side two thousand cubits, and on the north side two thousand cubits; and the city shall be in the midst: this shall be to them the suburbs of the cities.6And among the cities which ye shall give unto the Levites there shall be six cities for refuge, which ye shall appoint for the manslayer, that he may flee thither: and to them ye shall add forty and two cities.7So all the cities which ye shall give to the Levites shall be forty and eight cities: them shall ye give with their suburbs.8And the cities which ye shall give shall be of the possession of the children of Israel: from them that have many ye shall give many; but from them that have few ye shall give few: every one shall give of his cities unto the Levites according to his inheritance which he inheriteth.9And the LORD spake unto Moses, saying,10Speak unto the children of Israel, and say unto them, When ye be come over Jordan into the land of Canaan;11Then ye shall appoint you cities to be cities of refuge for you; that the slayer may flee thither, which killeth any person at unawares.12And they shall be unto you cities for refuge from the avenger; that the manslayer die not, until he stand before the congregation in judgment.13And of these cities which ye shall give six cities shall ye have for refuge.14Ye shall give three cities on this side Jordan, and three cities shall ye give in the land of Canaan, which shall be cities of refuge.15These six cities shall be a refuge, both for the children of Israel, and for the stranger, and for the sojourner among them: that every one that killeth any person unawares may flee thither.16And if he smite him with an instrument of iron, so that he die, he is a murderer: the murderer shall surely be put to death.17And if he smite him with throwing a stone, wherewith he may die, and he die, he is a murderer: the murderer shall surely be put to death.18Or if he smite him with an hand weapon of wood, wherewith he may die, and he die, he is a murderer: the murderer shall surely be put to death.19The revenger of blood himself shall slay the murderer: when he meeteth him, he shall slay him.20But if he thrust him of hatred, or hurl at him by laying of wait, that he die;21Or in enmity smite him with his hand, that he die: he that smote him shall surely be put to death; for he is a murderer: the revenger of blood shall slay the murderer, when he meeteth him.22But if he thrust him suddenly without enmity, or have cast upon him any thing without laying of wait,23Or with any stone, wherewith a man may die, seeing him not, and cast it upon him, that he die, and was not his enemy, neither sought his harm:24Then the congregation shall judge between the slayer and the revenger of blood according to these judgments:25And the congregation shall deliver the slayer out of the hand of the revenger of blood, and the congregation shall restore him to the city of his refuge, whither he was fled: and he shall abide in it unto the death of the high priest, which was anointed with the holy oil.26But if the slayer shall at any time come without the border of the city of his refuge, whither he was fled;27And the revenger of blood find him without the borders of the city of his refuge, and the revenger of blood kill the slayer; he shall not be guilty of blood:28Because he should have remained in the city of his refuge until the death of the high priest: but after the death of the high priest the slayer shall return into the land of his possession.29So these things shall be for a statute of judgment unto you throughout your generations in all your dwellings.30Whoso killeth any person, the murderer shall be put to death by the mouth of witnesses: but one witness shall not testify against any person to cause him to die.31Moreover ye shall take no satisfaction for the life of a murderer, which is guilty of death: but he shall be surely put to death.32And ye shall take no satisfaction for him that is fled to the city of his refuge, that he should come again to dwell in the land, until the death of the priest.33So ye shall not pollute the land wherein ye are: for blood it defileth the land: and the land cannot be cleansed of the blood that is shed therein, but by the blood of him that shed it.34Defile not therefore the land which ye shall inhabit, wherein I dwell: for I the LORD dwell among the children of Israel. Why did God create cities of refuge? What differed in the law pertaining to a murder out of hatred and an accidental death? 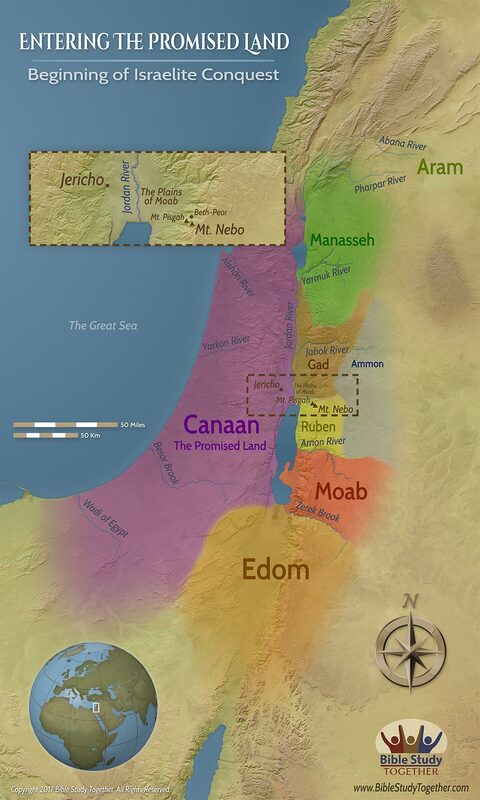 How did God provide a way for the Levites to spread out among the nation of Israel? How are the implications of God dwelling in the land similar to God dwelling in you? If hatred has taken root in your heart toward another ask God for help in releasing it.